Q: What are the ingredients. I’d like to add to homemade dog food. A: Broccoli, Kale, Kohlrabi, Arugula & Red Acre Cabbage. 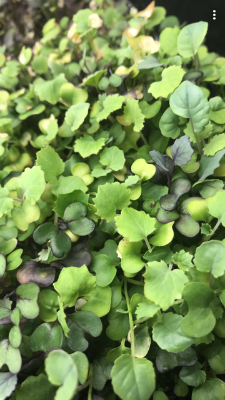 Q: I just received my order for basic micro green mix. The greens weigh .6oz. In the Q&A, you state that the weight is 2oz. My package is not even close to 2oz and they don’t smell fresh and there are a lot of greens wilted already. Very disappointed. A: I am sorry for the confusion, there was a time when our basic salad mix came as a 2 oz package. It was changed several weeks ago. We are sorry you are unhappy with the product. I will get you a $5 Market Wagon card via Market Wagon. Your product was harvested with in 24 hours of delivery, but sometimes things can happen in transportation. We strive to get the best product to you and apologize for the issue. Q: How much does this weigh, or what size container is this?